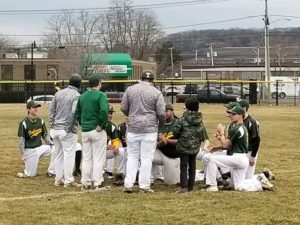 ROCHESTER, N.Y. – Mario Fiorauant settled down on the mound as Charles G. Finney took down East, 11-1, for a season-opening victory, Thursday afternoon, at East High School. Fiorauant hurled six innings, allowed one run on three hits with two walks and struck out two batters. The right-hander retired 14 of the last 15 hitters he faced, only three of which during that stretch did he allow balls out of the infield. Fiorauant recorded 10 groundouts, three flyouts, a lineout and a pop up. Fiorauant used the ground ball to get himself out of jams as well. After walking back-to-back hitters, the right-handed pitcher induced a groundball to third base to end the first inning. In the second inning, with runners on first and second and one out, Fiorauant got a pop up and groundball to first base to conclude the frame. Fiorauant received all the offense he needed in the first inning as the Charles G. Finney Falcons sent seven men to the plate and scored three runs on RBI hits from Elijah Harrow, Keegan Ocorr and Justice Smith. Ocorr smacked a double to left center and brought in Luke Francisco for the game’s first run. Harrow lined a single to left field to score Ocorr. Smith hit a single of his own to bring in Harrow, who had advanced to second base on a passed ball, to give the Falcons a 3-0 lead. The Falcons added three more runs in the third inning for a commanding 6-1 advantage. Sophomore Givanni Damico snuck a single down the third base line which scored Harrow and Ocorr. Freshman David Crandall reached first base on a fielder’s choice which allowed Justice Smith to cross the plate. Harrow led the Falcons’ offense, going 2-for-3 with a pair of walks, three RBI, a stolen base and scored two runs. Ocorr reached base in four of his five plate appearances and went 3-for-5 with a double and an RBI. The senior shortstop stole two bases and scored a pair of runs as well. Francisco was 2-for-4 with an RBI, a stolen base and two runs scored. Justice Smith recorded a hit, a walk, a pair of RBI, a stolen base and scored a run. Xavier Smith had a hit and scored two runs. Fiorauant provided offense of his own, going 1-for-3 with a single, a walk and two runs scored. For East, freshman Michael Conrow went 2-for-4 with a pair of singles. Alex Figueroa and Jose Ramos each recorded a hit. Charles G. Finney will host Lyndonville Monday at 4:45 PM. East will play Lima Christian Monday at 4:30 PM.